If you are thinking about buying a bus or coach for the first time, you are likely to have lots of questions about your insurance….and you should! Buying any type of public service vehicle is a huge investment and moving through each stage in the process can be particularly challenging. However, having some basic knowledge about bus and coach insurance can at least make one stage a little easier. How much will my bus or coach insurance cost? Premiums are determined by a number of different factors including the experience and driving history of the bus or coach driver, the value of the bus or coach, the number of passengers it carries and where the service is based. As with any type of insurance, the less risk you pose to the provider the cheaper you insurance will be. So, if you provide your service in a low crime, low traffic area for example, you should benefit from a cheaper premium than someone based in place that is prone to theft and congestion. However, it is essential that you do not withhold any information in the hope of obtaining a cheaper quote otherwise this could invalidate your policy. What happens if I have more than one vehicle? 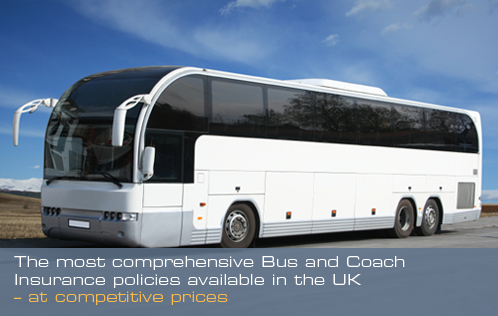 Bus and Coach Insurance UK can provide competitive fleet insurance for 2+ public service vehicles. This means that all your vehicles will be insured under the convenience of one policy, greatly reducing administration time and cost (compared to having two separate policies). Vehicles can also be added to a fleet policy throughout the year. Do I need any other type of cover? The most important thing to consider when buying bus or coach insurance is your passengers. Public Liability will protect you if a member of the public is injured or damage is caused to their property as a result of you carrying your services. Without this, the cost of expensive lawsuits and compensation could leave you in financial ruin. You may also want to consider employer’s liability, personal accident cover and legal expenses. Call busandcoachinsurance.net on 0800 980 3425 for recommendations on a suitable package for you and/or a competitive quote. Whatever your circumstances, we promise to work hard to bring you the lowest possible price.